A few months ago I finally got around to reading a book that's been on my bookshelf for, well for a ridiculously long amount of time considering it was a non-fiction book about baking. I had picked it up for $1 at a used book store and it had a giant sticker over the author's name, so I didn't pay too much attention to it. The book was Confections of a Closet Master Baker (and I guess it has now been re-published under a new title for some reason: My Life from Scratch, but from I can tell only the cover image and title changed). Anyways, the author's name is Gesine Bullock-Prado, which still didn't ring any bells until a good long way into the book at which time a lightbulb went on over my head: that's Sandra Bullock's sister! Huh. That's kind of cool. What was even more awesome about the book was the easygoing writing style, the not-sugar-coated stories (despite the high volume of actual sugar involved), and surprisingly the wonderful recipes included in the book. I have quite a few of them bookmarked for future experimentation, but as is my nature I had piled that book back onto the great big pile of things I still need to do and promptly forgot about it again for way too long. A little while ago I had decided to clean out my freezer and among all the other odds and ends I had found some leftover tart dough from a quiche I had made for Mother's day. Apparently it keeps extremely well if wrapped up tightly and stored in the back of the freezer. I had a pint of blueberries sitting in the fridge (there were two but I hoovered up the first one like popcorn) and all I needed was a recipe to put the two together. 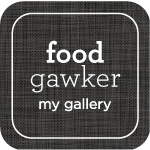 I did a quick search and found Dessert First Girl's blog, with a....book review for Gesine Bullock-Prado's cookbook: Pie It Forward! Her post was about the blueberry brown butter tarts from the book and they looked and sounded like just what I was looking for, so I used my crust scraps, whipped up her tart filling and made mini tartlets that I grabbed straight from the oven, tossed into a box and brought with me to an impromptu family brunch. I believe one comment was "This is the best thing I've ever put into my mouth!" I'll chalk that up as a success and Gesine's book is now back at the top of my todo pile. For the crust I used the leftovers from here, but you are also welcome to make the crust from Dessert Girl's post. - If you're using up dough leftovers like I was, let the dough defrost in the fridge overnight. Flour the counter and roll out the dough to about 1/4" thickness. Cut out circles of dough to fit into mini tart pans, press it in and dock the bottom with a fork. Let the prepared pans rest in the fridge or freezer for 15-20 minutes while you preheat the oven to 350F. (Otherwise just use your own crust and pre-bake it like I did). - Fill your tart pans with parchment paper (I like to crumple it up so that it fits into the pans better) and pie weights/beans/rice and pre-bake for 15 minutes or just until the bottoms no longer look wet. In the mean time, make your filling. - Combine eggs, sugar, vanilla, and salt in a medium bowl and whisk together. - Sift flour over the mixture and carefully fold in. - Place butter in a medium saucepan and melt over medium-high heat until melted. Continue cooking until butter has lightly browned and begins to smell nutty. Keep a careful eye on it because once it starts browning it can burn really quickly and become unusable. Remove from heat and let cool slightly. - Pour browned butter into egg mixture and whisk to combine. 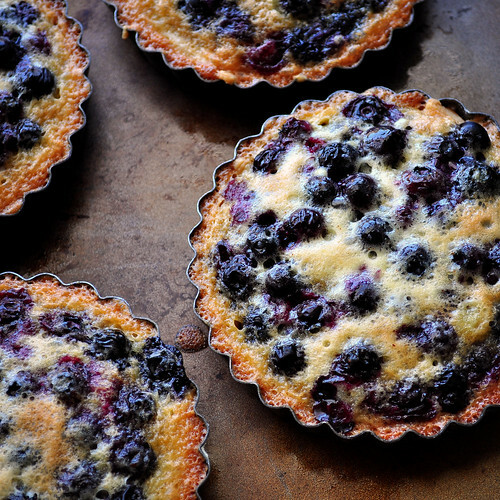 - Divide blueberries among the tart tins. Pour the butter mixture over the berries until they are just covered. 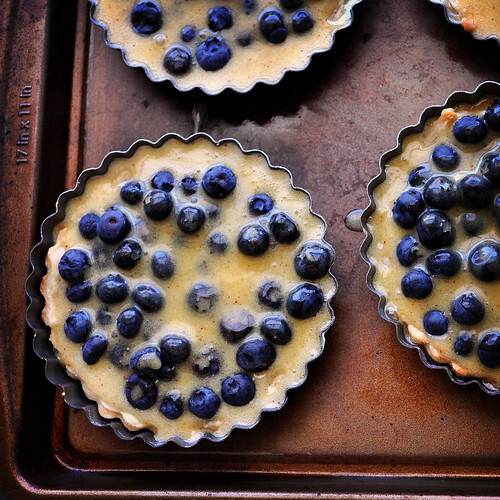 - Bake tarts for 20-25 to minutes, until the top crust is browned and filling is bubbly. - Let it cool completely before removing from the tart tins or you'll end up burning your hands. Ask me how I know that. This loks delicious! How many tartlets does this recipe make?